Every long distance cycling trip we take starts with a laundry list of detailed preparations. Route selection alone can take months. After all, half the fun is pondering the options and researching a variety of potential destinations. Once that is settled, a map is produced and we move on to checking out sightseeing, lodging options and local specialties. The final push includes gathering our gear, making sure everything is in tip top shape (including ourselves) and checking off each item on our packing list. But we’re still not ready to go. The last essential piece is Marketing. What would a tour be without a distinctive name? a logo? and of course, matching jerseys? There’s no mistaking our mission when we’re out on the road, and that is no accident. Our shirts say it all. This shameless bit of of self-promotion actually contributes a lot to the trip. Somehow our jerseys make us approachable. Just sporting a blatant advertisement for our journey invites questions, from the random query at a rest stop to swapping fascinating stories over breakfast in a café. We’ve even had folks ask how they can sign up for the tour! This year the name came fairly quickly. Starting in the south we’re following the spread of the warm weather, hence Spring North. The logo was an obvious choice. Seeing the bluebonnets of Texas in bloom will be a highlight of this trip, so a blue flower won hands down. And the jerseys, well, let’s just say we picked an eye-catching color. Now one might naturally assume we’d have blue jerseys to go with the theme. But this color maven complained that we’d done blue too many times already. I need some variety in my cycling apparel. Little did I know that when Rich mockingly said “how about pink?” that he was serious enough to carry it through. I should have known better. 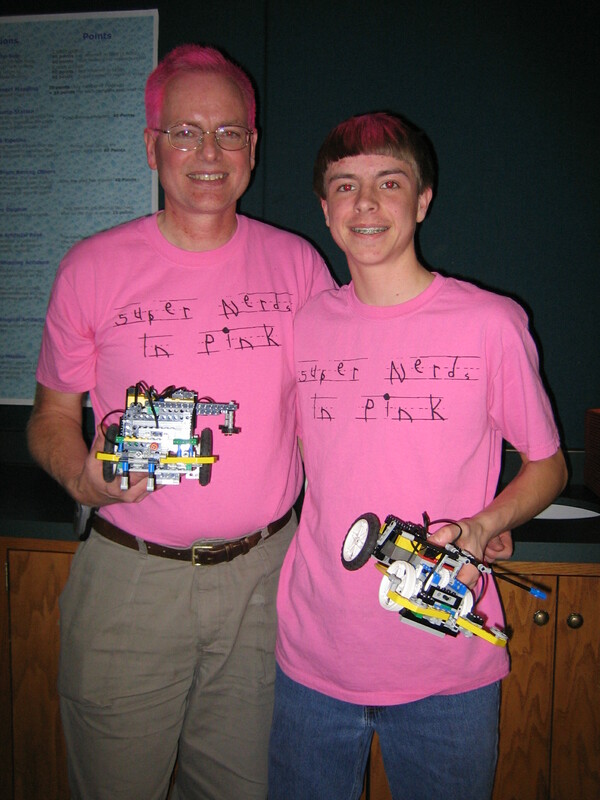 Back when our son was on a Lego League team, they chose the name “Super Nerds in Pink.” Being a supportive coach who was anxious to motivate his team, Rich promised the boys that he’d let them spray paint his hair pink if they made it to the state tournament. Well, the boys delivered and Rich made good on his pledge. A precedent was set. Today a package came – our custom jerseys had arrived. Tearing into the bag, we pulled out our prizes. Yes, they’re pink all right. We’d better like them, we ordered two each. Wear one, wash one – that means we can always be in uniform. There will be no missing us this year. 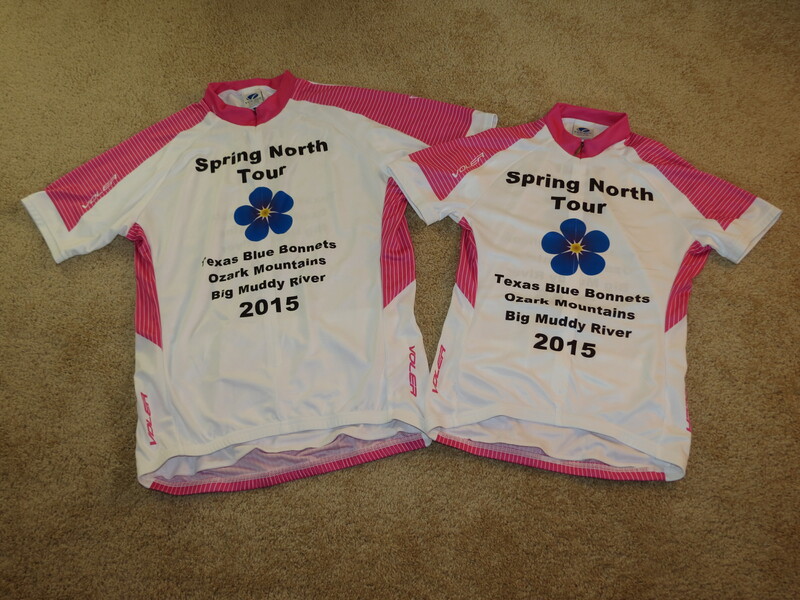 We’ll be the folks cycling in the pink. This entry was posted in Keeping Fit and tagged Cycling, Cycling Trip, Spring North Cycling Tour by Molly. Bookmark the permalink. NIce shirts–you certainly are making the most of “retirement”. Biking is a great way to see the country. Has much more flexibility than canoeing. Good luck on your next adventure. Look forward to reading the blog posts. Loved the lego picture. Love the color & logo so apropos! Well you wouldn’t be biking here any time soon just received another blizzard that dumped another 45 cm to date over 440 cm and more on the way . Thank heavens we also love to ski. Looking forward to reading your blogs.